Presentation platforms have multiplied the last couple of years. You can hook your Surface to a projector or sync your iPad with an AppleTV and present away. 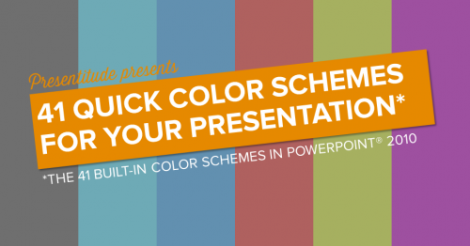 You can use PowerPoint, Keynote or Prezi for your presentation or new platforms like Emaze or Haiku Deck. But there is one thing that is mandatory and doesn’t really care about your platform, and that is a presentation remote (and we’re not talking about one of those remotes laying around your sofa table and that you don’t know how to use anyway). At Presentitude™ it is mandatory to always carry one in your laptop bag, ready to be plugged-in and used whenever a slideshow is open. 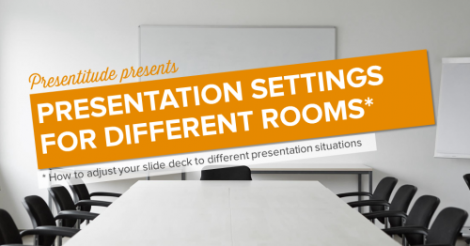 Or have a presentation remote app prepared using your smartphone. It really is as essential as the laptop charger. A remote can transform you from mediocre presenter to a potential of being a star presenter. Why? You don’t have to pause and put your head down, constantly looking at your computer on the desk or podium finding the right key to advance your presentation. You can move around the room freely and take more control of the presentation and hook and engage the audience to what you’re saying (provided you have made sure you are bringing your microphone with you if it’s needed for the room) (otherwise, stay by the mic!). You can easily advance slides without losing momentum instead of constantly have move back to your computer to advance to next slide and time it to your transitions. 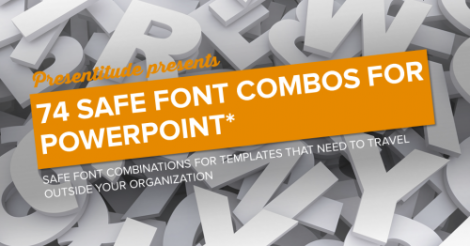 Do you feel more secure staying behind your laptop screen as you use presenter view in PowerPoint? Come in early for your presentation and set up your “stage”. Bring an extension projector cord and an extension cord for your charger so you are not limited to place your laptop in a specific place. Use a chair or table (or the floor!) and set up the computer at an angle from where you can see the screen but still can move freely. What remote brand should you use? A Logitech, Keyspan or Targus, a Kensington? Or an app for your smartphone or tablet? It doesn’t really matter. Do you need fancy functions, like a laser pointer, mouse functionality? Probably not. 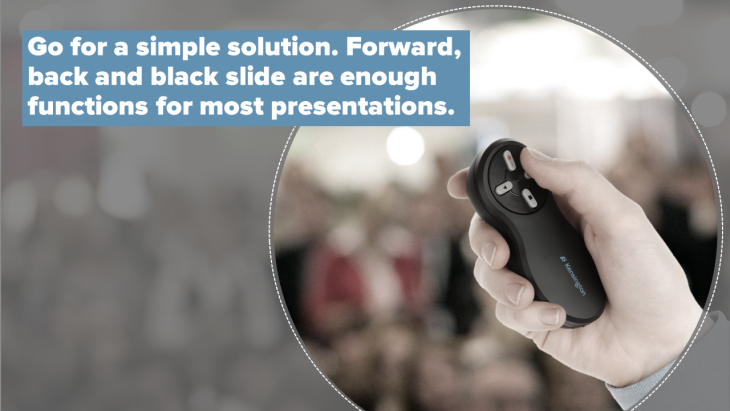 Forward, backward and black slide is probably enough for most presentations. But once you’ve got the hang of it, you might want to increase functionality and become even more remote savvy. The most important aspect of choosing a remote regardless of brand or solution is that the remote should be easy and smooth to hold and be discrete in your hand so its use is not being intrusive to your presentation. There are many different types of remotes and different app solutions – but as long as you at least have one with you (or installed) next time you’re running a presentation, we’re happy.And don’t forget – you need to practice using your clicker before presenting. 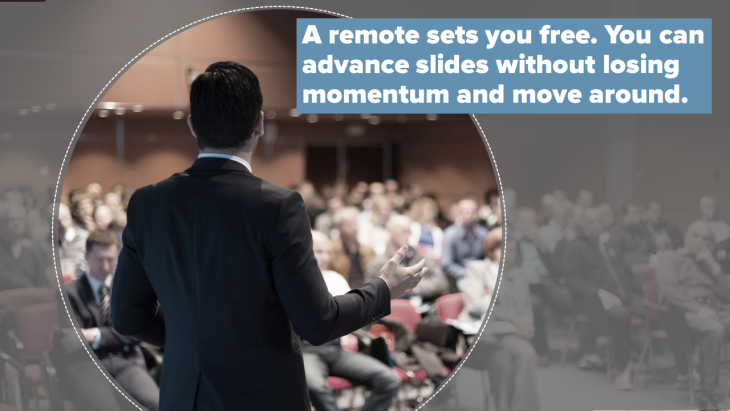 Fumbling when using a remote is actually worse than using your computer to run the presentation. (This Keyspan is a clicker we have used with good results and that is a bit more than basic but in the mid price range but simple enough with out to many bells and whistles).